Kellogg Doctoral Student Affiliate Emily Maiden, who is completing her PhD in political science and peace studies through the Kroc Institute for International Peace Studies is currently conducting 10 months of research in Malawi for her dissertation, “We Will Marry When We Want: Evaluating Organizational Approaches to Ending Child Marriage in Malawi.” Her committee is cochaired by Faculty Fellows George Lopez and Jaimie Bleck. During this trip, I collected nearly 1,000 completed baseline surveys from Malawian women in 21 research sites across the central region. The survey asks women questions on a range of topics, including women’s rights, gender roles, health and HIV/AIDS, cultural practices, and Malawian law. I am interested in understanding what the average Malawian woman knows about her rights as protected by the law, what she knows about how to protect and promote her own health, and her opinions on the roles of women in Malawian society. One finding became very clear: women in Malawi do not know their basic rights. My moderators reported that women were “upset,” “embarrassed,” “confused,” and/or “dismissal” of questions related to rights and laws because they didn’t know the answers. In many cases, the moderators reported that answering the survey questions emboldened the women and made them angry, not at the survey, but at their ignorance: “Why don’t we know the answers?? We should know our rights!” Many women said that participating in the baseline survey was an important first step in becoming more empowered individuals. One of my moderators begged that when I return I bring copies of the Malawian constitution, since many women do not know Malawi has a constitution—in some cases, they do not even know the meaning of the word “constitution.” How can a woman know her rights in terms of marriage, divorce, rights to work, rights to maternity leave, etc., if she does not know that her country has a nationally codified legal system that outlines these protections? This is the first time I have designed, piloted, implemented, and coded my own survey. I’ve already learned so much from round one that will impact how I continue with the second round. For example, when relying on moderators, you must be able to trust that they will do their jobs exactly as trained. During my trip, I was forced to remove four research sites from the study because I could not rely on the moderators to do their jobs. I also ran into problems in terms of funding. I provided each team with a small fund to cover transportation costs so they could reach participants in their homes. 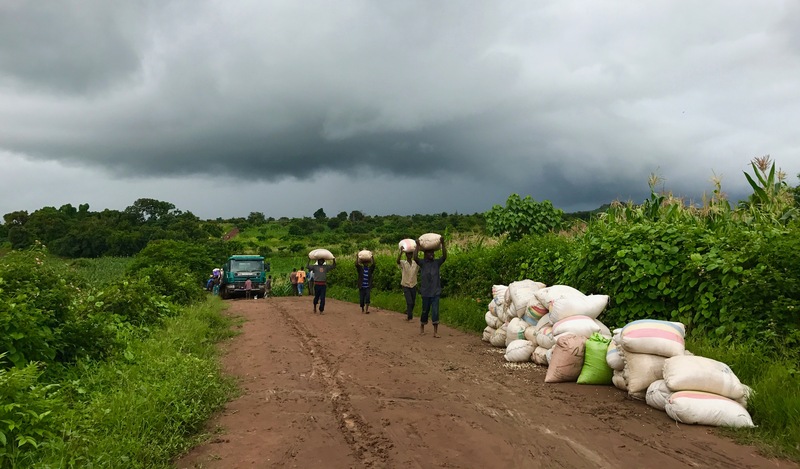 Given the very rural nature of Malawi, and the fact that it is the rainy season, many moderators had trouble reaching participants in the more remote villages. One of the villages I went to on a site visit is found 23km off the tarmac down an unpaved road. Driving through the mountains, it takes almost an hour to reach the village. The moderators in this area had to hire motorbikes or take minibuses to reach even more remote villages to find women to participate in the survey. This meant that the budget I provided them was not enough to cover their actual costs. The problem of transport became a scramble for me personally as money exchanges in Malawi are rare and ATMs even more so. Anytime we went through Lilongwe I ran to an ATM so I would be ready at the next site visit meeting to address the issue of transport costs. I anticipate that roads and transportation will prove the biggest obstacle for me to conduct fieldwork in Malawi. During my short time there, we had a van slide off the road into a deep ditch; we had to turn around several times because of impassable roads; we almost got stuck more than once; and we once had to stop 2 km short of a village due to the road being blocked by a maize truck stuck on a hill. We watched as men from the village volunteered to unload over 100 bags of maize from the back of the truck to make it lighter so it could be pulled up the hill by ropes. As we watched, another smaller truck was pushed and pulled up the hill with ropes by a group of almost 30 men. This is a normal occurrence during the rainy season. Another issue is the presence of roadblocks. All roads in and out of Lilongwe contain police checkpoints, and it is quite common for the police to extract bribes before cars can pass, especially if white people are in the car. Our driver was “fined” for missing a newly required certification on his license. Once we passed the checkpoint, he clarified that the new certification was bogus and that he talked them down from a 10,000-kwacha bribe to a 5,000-kwacha bribe. We joked that from then on, all the white people in the van should duck as we approached a checkpoint! My favorite part of this trip was meeting the team members I had never met before, but with whom I’ve been working via email for months. Everyone was so welcoming and eager to move forward with my project. Since I will live in Malawi for ten months, I was excited to build a community of friends and colleagues on whom I can call when I return. 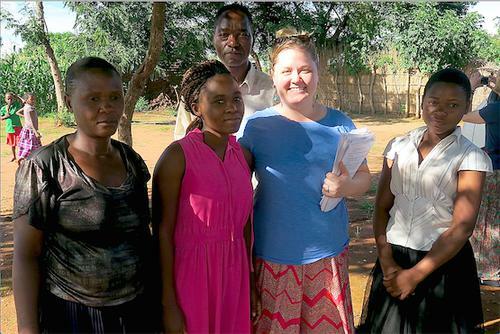 For my short two weeks in Malawi, I was surrounded by a great team of Malawians and Americans. Sharing meals, long car rides, tea breaks, and meetings, I gained a sense of clarity about the direction I see the rest of my research taking. *This report has been edited and condensed. Faculty Fellow Cat Bolten was featured in Women Lead 2019, a Notre Dame initiative to celebrate International Women's Day by highlighting the work of seven influential faculty members.